Hummingbird Tattoos. One of the most popular bird tattoos. Hummingbird tattoos are popular for many reasons. 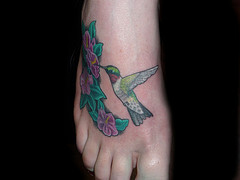 A beautiful tattoo of this brightly colored bird can be an exquisite work of hummingbird art. Adding to the design, there are usually beautiful flowers. This also allows for the opportunity to select flowers with a special meaning. They are actually the most popular bird tattoos. There are many reasons for this besides the beauty of the bird. Even though they are birds of the Americas, everyone in the world knows about the hummingbird. It is the most coveted of all birds. People in every country choose these tattoos. As a result you can see hummingbird images everywhere including tattoos. 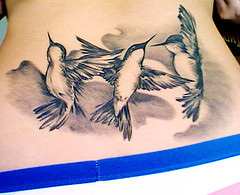 Anyone who gets a hummingbird tattoo can expect to have it admired. Some people get them strictly for themselves because they simply love hummingbirds. Others have different reasons such as in remembrance of someone else. These tattoos are worn by both men and women. Besides flowers, they are combined with just about any other imaginable such as boats, cars or house. Besides being cute, hummingbirds have powerful symbolism. They are considered by Central American people to possess great supernatural powers. Today, they are often considered to be a symbol of love, joy and beauty. Wearing a hummingbird is thought to attract a lover. A Mayan legend claims the hummingbird is actually the sun in disguise and he is trying to court the moon, who is a beautiful woman. For those who have been hurt, the hummingbird is believed to be the creature that heals the heart and opens it once again to love. On the other hand, there are many other symbols for hummingbirds. They were regarded by the Aztec Indians for their courage, valor and bravery. Since they fly at great speed, the birds are often known as messengers and stoppers of time. Migrating long distances, the tiny creatures are icons of freedom and unlimited boundaries. Hummingbirds hover at a flower teaching us to savor the moment and appreciate its beauty. When cold, a hummingbird goes into a hibernation like state of “torpor”. As a result, these iridescent beings represent birth, re-birth and intuition since they are associated with spirituality. The most widespread legend about hummingbirds is that they are messengers between worlds. Hummingbird tattoos are usually small and can fit anywhere on the body including the shoulder, back, ankles and arms. There is no reason to fear a permanent tattoo of this small size. A hummingbird on a shoulder can attract a lot of attention. It can appear as if the bird has landed on the shoulder. Since tattoos are chosen for their appearance and symbolism to fit the personality of the recipient, we can easily understand why tattoos of hummingbirds are popular with both girls and guys. 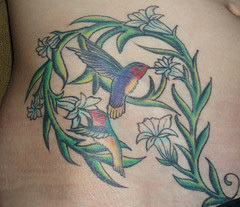 Tattoos are not typically the first thing that comes to mind when we think of hummingbird art. The body, however, becomes the canvas for this form of art!